You are here: Home / Ogg Like! When people think of cavemen they usually think of people who lived in caves. That would seem to make sense with the term. But, in reality, very few lived in caves. They worshiped in them, buried their dead in them and used them for storage but, otherwise, lived outside. In huts. We also tend to think of them as scared, cretinous, savages. That is a hold over from 18th and 19th century scientists who imposed a very Euro-centric view on our ancestors. If people weren’t blue eyed and white how could they be smart? Those racist treatises still get trotted out from time to time by idiots who don’t know anything about actual science. Another trope is that the early humans stayed in one place. Common sense proves that wrong otherwise why are there people all over the world? We didn’t sprout like flowers. We came from somewhere. And that somewhere was Africa. The big question has always been how did our ancestors travel? Did they just walk all over the world? In some cases that answer is yes. A variety of factors could make them do that; searching for food, new mates, better land, almost any reason you could think to move today would have come up then. But they also had boats. Crude ones, to be sure, but they worked. As Thor Heyerdahl proved in 1947, you could take a raft across an ocean as long as you didn’t hit storms. All of this brings us to the tale of the Olmecs. This is a statue featuring an Olmec face. If your first thought is that the features look African, you’d be right. If your second thought is that it’s no big deal since there are lots of Africans in Africa, you’d be half right. While there certainly are, the Olmecs lived in South America and predated the Incans and the Mayans by centuries. Stone tools and charcoal from the site in Brazil show evidence of human habitation as long ago as 50,000 years. Archeologists agree that the Mayan and Aztec civilizations – which began thousands of years after the Olmec civilization ended, definitely inherited the bulk of ancient pyramids and advanced pre-columbian art and artifacts previously called ‘Mayan’ or ‘Aztec.” The Aztecs and Mayans used the pyramids for blood-letting and human sacrafice, but the Olmec people they inherited the pyramids and giant stone heads from did not. The site is at Serra Da Capivara in remote northeast Brazil. This area is now inhabited by the descendants of European settlers and African slaves who arrived just 500 years ago. But cave paintings found here provided the first clue to the African looking people who we now call Olmec. Dr. Walter Neves has measured hundreds of skulls, the next step was to reconstruct a face from Lucia’s skull (the name scientists gave this 20 year old, African looking woman who died 11,000+ years ago in South America.) First, a CAT scan of the skull was done, to allow an accurate working model to be made. Then a forensic artist, Richard Neave from the University of Manchester, UK, created a face for Lucia. The result was surprising: “It has all the features of a negroid face,” says Dr Neave. Getting from Africa to Central America isn’t as crazy as it sounds. There are thousands of islands dotting almost any path they could have taken. They may have even settled on some and intermarried with natives along the way. We do know that Stone Age people were a hardy lot. And we also know that their descendants, members of the iron age and so on, traveled extensively. What happened to the Olmecs is a bit of a mystery but it doesn’t involve aliens. Most likely they intermarried with the Asian and Indian explorers who came afterward. Since it’s doubtful they had a huge population they would have needed new genetic stock to keep their families alive. So why bring all of this up now? Because the Stone Age is happening again. As Eric March reports, another species has started taking steps towards sentience and climbing the evolutionary ladder. And then learned to tiptoe away slowly when it got … a little out of hand. We made this from a wolf. And selling it at our craft stores in Mendocino. It’s possible these creatures are a lot more like us than most of us give them credit for. And who knows where they might be in the next few thousand years? …it might be time to reassess how we treat our primate cousins. Many countries like New Zealand and the U.K. have banned experiments on chimpanzees and other apes, and some others, like Spain, have gone as far as to grant them limited human rights. Here in the U.S. we haven’t gotten quite so far, but calls for change are growing. A lawsuit pending in New York courts alleges that chimpanzees deserve full personhood and the protections that accompany it. Even if we’re not willing to go quite that far just yet, the more empathy and kindness we can extend to chimps and other apes, the better. Otherwise, we might be in for a rude awakening sooner than we think. As noted above Chimps are already making stone tools. Thus the term “Stone Age.” This is a relatively new development. Primates have used plant based tools, twigs for example, for as long as they’ve been around. They could use them to pull ants and termites out of mounds and then eat them. But that isn’t what we’re talking about here. These primates are manufacturing tools. And manufacturing them for specific purposes. That is a level of self awareness we’ve never seen. So how about the rest of the list? Well, we do know they haven’t tamed fire, but that came later for our ancestors as well. New Scientist reports that some herds are doing just that. The unusual pact echoes the way dogs began to be domesticated by humans, and was spotted by primatologist Vivek Venkataraman, at Dartmouth College in New Hampshire, during fieldwork at Guassa plateau in the highlands of north-central Ethiopia. Even though the wolves occasionally prey on young sheep and goats, which are as big as young geladas, they do not normally attack the monkeys – and the geladas seem to know that, because they do not run away from the wolves. “You can have a wolf and a gelada within a metre or two of each other and virtually ignoring each other for up to 2 hours at a time,” says Venkataraman. In contrast, the geladas flee immediately to cliffs for safety when they spot feral dogs, which approach aggressively and often prey on them. When walking through a herd – which comprises many bands of monkeys grazing together in groups of 600 to 700 individuals – the wolves seem to take care to behave in a non-threatening way. They move slowly and calmly as they forage for rodents and avoid the zigzag running they use elsewhere, Venkataraman observed. This suggested that they were deliberately associating with the geladas. Since the wolves usually entered gelada groups during the middle of the day, when rodents are most active, he wondered whether the geladas made it easier for the wolves to catch the rodents – their primary prey. Venkataraman and his colleagues followed individual wolves for 17 days, recording each attempted capture of a rodent, and whether it worked. The wolves succeeded in 67 per cent of attempts when within a gelada herd, but only 25 per cent of the time when on their own. 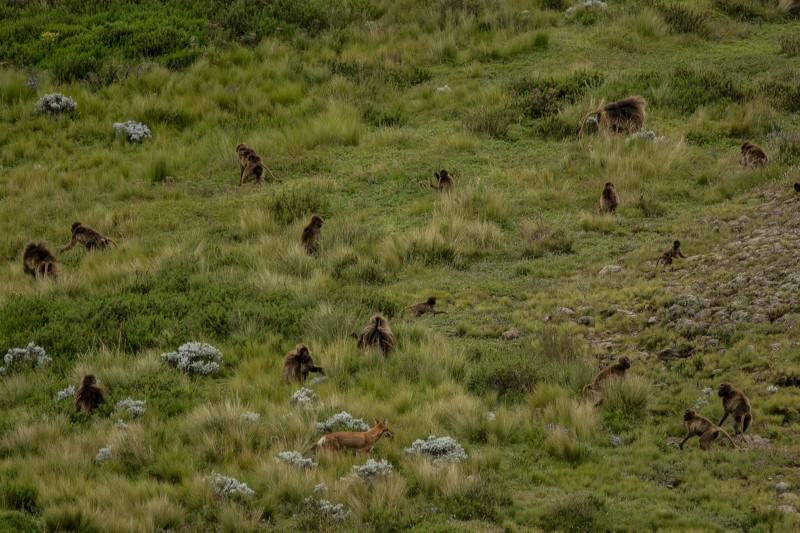 It’s not yet clear what makes the wolves more successful when they hunt within gelada groups. It could be that the grazing monkeys flush out the rodents from their burrows or vegetation, Venkataraman suggests. Whatever the mechanism, the boost to the wolves’ foraging appears to be significant enough that the wolves almost never give in to the temptation to grab a quick gelada snack. Only once has Venkataraman seen a wolf seize a young gelada, and other monkeys quickly attacked it and forced it to drop the infant, then drove the offending wolf away and prevented it from returning later. The wolves may benefit from associating with other species as well. For example, Sillero has noted that they also tend to forage in the vicinity of herds of cattle, which may help them catch rodents. Other predators might also be doing this without anyone noticing, says Colin Chapman, a primatologist at McGill University in Montreal, Canada. “I don’t think we’ve looked at it very much, because the predators are usually scared off by people. I think it could be pretty common,” he says. Here, they were even kind enough to share Jeff Kirby’s amazing shot of the monkeys and the wolves working together. Click on it to see the full sized shot. Also, if you’ve seen the Facebook video about baboons kidnapping puppies to be their pets, please be skeptical. As Hal Herzog, from Psychology Today, points out that video raises more questions than it answers and, just FYI, it was filmed at a garbage dump which attracts numerous species. Unless we get footage of the baboons feeding and housing the dogs, one of which has a collar in the video (a big no-no in a Muslim country and clearly not a wild animal), then we can assume they’re just eating and tolerating each other’s company due to the abundance of food. It’s that kind of shoddy work that demeans the legitimate science being done by Dr. Venkataraman and his colleagues. How about pottery? They’re on their way. As I noted back on June 20th, chimps are already using leaves and bark to create vessels to hold liquid and transport it. The first step to making a jar is realizing you need one. And they have crossed that threshold. Another thing to keep in mind is that stone tools were first used by proto-humans to sharpen sticks to make them better spears for hunting. Primates all over the world now do that. Oh, and once you learn to work stone, chipping flints to make fire is just a stone’s throw away. Evolution from Mehdi Alibeygi on Vimeo.